In recent years phytotherapy has been encouraged by Brazilian government agencies and has gained more and more credibility as a way of alternative therapy to complement allopathy. Although little explored in Brazil, seaweeds are promising marine bioresources as herbal medicine. 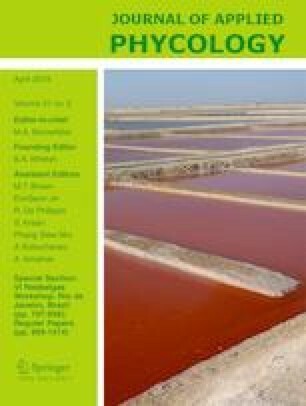 In this context, the aim of the present study was to evaluate the antioxidant activities and reverse transcriptase inhibition (RT-HIV) of crude extracts (methanolic, aqueous, and hot aqueous) from three abundant species in Brazilian rocky shores, Sargassum vulgare (Ochrophyta), Palisada flagellifera (Rhodophyta), and Ulva fasciata (Chlorophyta), under two seasons (dry and rainy). Methanolic extracts from S. vulgare (EC50 = 18.22 ± 2.91 μg mg−1, dry), P. flagellifera (EC50 = 24.85 ± 3.13 μg mg−1, rainy), and U. fasciata (EC50 = 33.41 ± 1.53 μg mg−1, dry) showed the highest β-carotene bleaching activities, while hot aqueous extracts from S. vulgare showed the highest RT-HIV inhibition and antioxidant activities in ABTS, FRAP, and Folin-Ciocalteu assays. In general, the three macroalgae showed considerable antioxidant effects; however, only S. vulgare showed an anti-HIV potential (IC50 10.15 ± 1.77 mg mL−1 for the dry season and IC50 = 22.41 ± 5.74 μg mL−1 for rainy season). Regarding both extract yields and bioactivities, S. vulgare in the rainy season was the most promising alga. In conclusion, the studied seaweeds may be an effective alternative for Brazilian herbal medicine; additionally, seasonal studies are essential, since there were significant differences mainly for extract yields. The authors thank Dr. Beatriz Torrano da Silva, Marizete Pereira dos Santos, and CEPLAC (Comissão Executiva de Planejamento da Lavoura Cacaueira) for research cooperation. The authors would like to thank CAPES (Coordenação de Aperfeiçoamento de Pessoal de Nível Superior) and FAPESP (Fundação de Amparo à Pesquisa do Estado de São Paulo (Biota/Fapesp 2013/50731-1) for financial support. FC thanks CNPq (Conselho Nacional de Desenvolvimento Científico e Tecnológico) for the productivity fellowship (Proc. 303937/2015-7).